The Beautiful Game commemorates the events of Christmas day 1914, during the early stages of the First World War, when an unofficial truce called a temporary halt to the fighting on the Western Front. It was widely documented, by soldiers from all ranks and from both sides, that improvised football matches took place in no-man’s land during the truce, though their reports of the scores vary. The work adopts the genre of Crested China, a form of Staffordshire ceramic souvenir-ware popular during World War 1, to commemorate this extraordinary event, described by Sir Arthur Conan Doyle as “One human episode amid all the atrocities which have stained the memory of the war”. 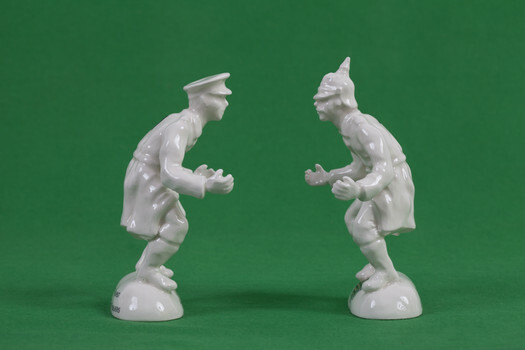 The slip-cast figures are printed with the names and regimental crests of individual soldiers known to have witnessed or participated in the Christmas Truce, through their published letters, diaries and testimonies. In this way, the piece bears material testimony to the veracity of this event. Weintraub, S. (2001) Silent Night: the story of World War 1’s Christmas Truce. Brown, M and Seaton, S. (2001) Christmas Truce: The Western Front December 1914.